Former alum, Marc “Bubba” Digesti, played first base for the 1999 N. Nevada Zone-Champion Huskies. He is now the strength coach for the US Disabled Ski team. He currently lives in San Deigo. Below lists a story about a recent DVD he helped produce about his U.S. Ski Team. COLORADO SPRINGS, Colo. (May 21) – The U.S. Disabled Alpine Team took full advantage of excellent late-season conditions in Colorado to mix up on snow fundamental work at Arapaho Basin with physical testing at the U.S. Olympic Training Center in Colorado Springs. But, the best part was they caught it all on tape. With a projected debut of December, the Team is producing a set of DVDs to assist grassroots programs in developing young skiers. The first will be based on alpine fundamentals complete with drills and documents outlining how to properly facilitate and apply the drills. The second will be a highlight film of disabled alpine skiing at the highest level, featuring footage of U.S. 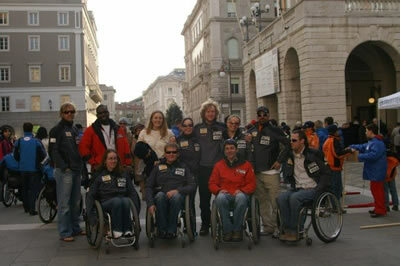 Ski Team members and other top world skiers in competition. Both will be available through U.S. Ski and Snowboard Association Coaches Resource Center. The film, designed as an educational piece for disabled coaches, will feature both action video and still shots with narration from the U.S. coaching staff including Watkins, Ben Roberts, Kurt Smitz, Marc Digesti and Ian Garner. Also on snow for the project were Brad Washburn (sit-ski; Highlands Ranch, CO), Carl Burnett (sit-ski; Cape Elizabeth, ME), Elitsa Storey (standup; Sun Valley, ID), Gerald Hayden (sit-ski; Fresno, CA), George Sansonetis (standup; Fraser, CO), Laurie Stephens (sit-ski; Wenham, MA), Monte Meier (standup; Park City, UT), and Roger Lee (sit-ski; Wildomar, CA). World Cup overall winner Stephani Victor (sit-ski; Park City, UT) and Joe Tompkins (sit-ski; Juneau, AK) are currently rehabbing injuries. Following six days at Arapaho Basin with perfect spring training conditions, the team packed up for the OTC in Colorado Springs for two days of physical testing. According to Watkins, it was a grueling couple of days, yet full of positives as the Team refuels for another season. “I think the athletes are always surprised at how difficult these physical testing camps really are, but the data we get allows them to track their progress throughout the season and from one season to the next. It’s one of the most important things we do as a team and the staff at the OTC is always incredible,” added Watkins. The Team will be back on-snow in July for a two-week camp at Oregon’s Mt. Hood. CORVALLIS, Ore. – Oregon State catcher Mitch Canham and outfielder Joey Lakowske were on the first team when the Pacific-10 All-Academic Baseball Team was announced Thursday. Beaver pitcher Joe Paterson was named to the second team and OSU pitcher Jake McCormick and outfielders Scott Santschi and John Wallace earned honorable mention. To be eligible for selection to Pacific-10 All-Academic teams, a student-athlete must have a minimum 3.0 overall grade-point average and be either a starter or significant contributor. For Canham (Lake Stevens, Wash./Lake Stevens HS), a junior majoring in Business Administration, it was his third time as a first-team selection. For McCormick (Marysville, Calif./Erindale HS, Australia), a senior majoring in Sociology, it was his third time earning honorable mention. For Lakowske, Paterson, Santschi and Wallace, it was their first time being named to the squad. Lakowske (Corvallis, Ore./Crescent Valley HS) is a redshirt freshman majoring in Business Administration. Paterson (McMinnville, Ore./McMinnville HS, Linfield Coll.) is a junior majoring in General Agriculture. Santschi (Vancouver, Wash./Skyview HS, CC of Spokane) is a senior majoring in Business. Wallace (Reno, Nev./Reno HS) is a sophomore majoring in Business.